I think I am addicted! I just can't seem to stop stitching. 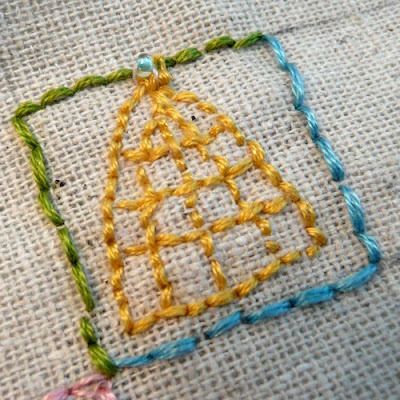 And fortunately for me (and you too if you'd like to join in) Amy over at Inspire Co. has started the 39 Squares Project. 39 one-inch squares, one each day for 39 days. It's kind of like an embroidery version of inchie-art. 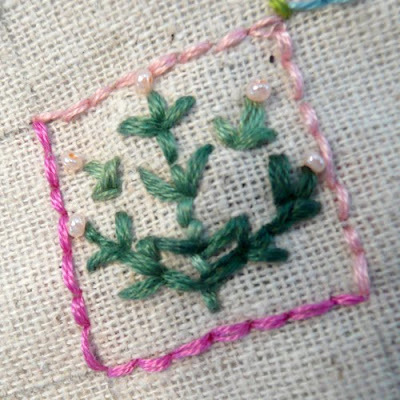 I love tiny things and who can't fill up a one-inch square in a day? I work on mine in the evening while watching TV. In other news, get your crafting supplies ready because the Joli Paquet team is starting up a new round of wonderful tutorials and kits just perfect for all the Spring Holidays. The Spring Fling event starts the week of March 15th and you can read all about it here. Also, we are looking for a few Guest Artists to feature throughout the year, so if you have a desire to join us then you can check out all the details here. Jeanne I love your little stitches. I can't wait to see how the whole thing turns out! Love your squares!!! I'm playing along too. I miss stitching so I started last night. Such a doable project! how darling!!! i would love to play too...as i want to learn to stitch and do embroidery...unfortunately i only have 4 colors of floss right now, and i think that would be rather boring...LOL...i can't wait to see all of your little stitched up squares Jeanne!!! Your squares are wonderful. I love the beehive. This is fun, isn't it? hello...i was over at Claudia's and saw her squares...now yours...how fun is this!!! i'm playing with my crochet cotton threads today!